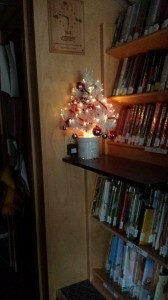 This December, the NMSL Rural Bookmobile East delivered holiday cheer to our rural patrons. 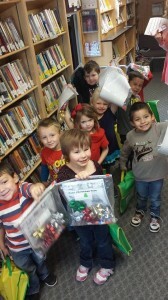 At San Jon School, Bookmobile Manager Geri Marquez and her team showed the Kindergarten class how to make a tree out of gift bows, and also sent them off with baggies of supplies and instructions to do their own at home. She also read ‘Twas The Night Before Christmas’ before they headed back to class. At Logan Autumn Blessings, the bookmobile team changed out the book cart available at the center, and then the group gathered recited the Pledge of Allegiance led by a patron who is one of the only remaining members of the Bataan Death March. 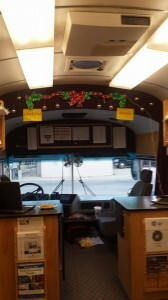 Bookmobile team member Marcy then read “‘Twas the Night Before Christmas” and “Snowman” from a Christmas story book. The group then sang “Rudolph the Red-Nosed Reindeer” led by a patron and Geri played some songs on the Native American flute. 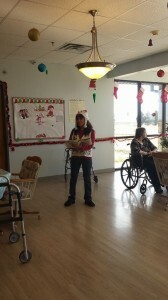 Marcy read Christmas stories to the patrons. Not only did the Bookmobile East team have fun with the patrons, but they also filled the Bookmobile with cheerful decor!